The actor Osagawa Tsuneyo I held this name the end of the 1740s to the 5th lunar month of 1766. 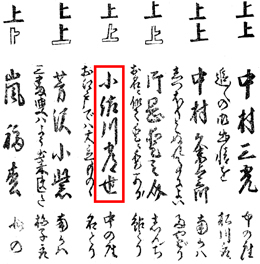 The actor Osagawa Tsuneyo II held this name from the 11th lunar month of 1768 to the 8th lunar month of 1808. Dates of birth and death unknown. Disciple of Osagawa Tsuneyo II, his first stage name was Osagawa Takejirô. 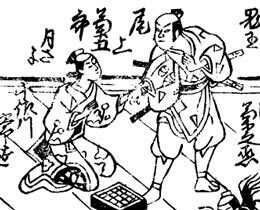 He took the names of Osagawa Shichizô II in the 11th lunar month of 1792 and Osagawa Tsuneyo III in 1811. 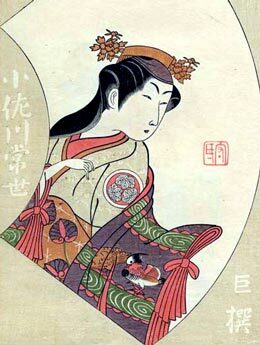 He went to Ôsaka in 1812 and his name appeared in a theater playbill for the last time in 1813. 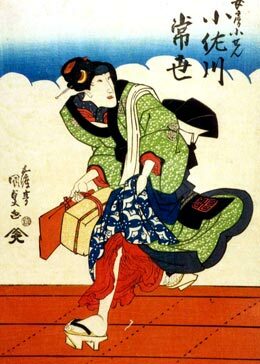 He was a wakaonnagata actor but did not achieve any reputation in Edo. The actor Osagawa Tsuneyo IV held this name from the 11th lunar month of 1823 to 1850.